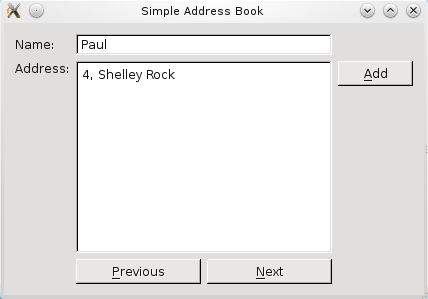 The address book is now about half complete. We should add the capability to navigate among the contacts, but first we must decide what sort of a data structure we need for containing these contacts. In the previous section, we used a QMap of key-value pairs with the contact's name as the key, and the contact's address as the value. This works well for our case. However, in order to navigate and display each entry, a little bit of enhancement is needed. We enhance the QMap by making it replicate a data structure similar to a circularly-linked list, where all elements are connected, including the first element and the last element. The figure below illustrates this data structure. In the AddressBook constructor in addressbook.cpp, we instantiate nextButton and previousButton and disable them by default. This is because navigation is only enabled when there is more than one contact in the address book. The image below is the expected graphical user interface. 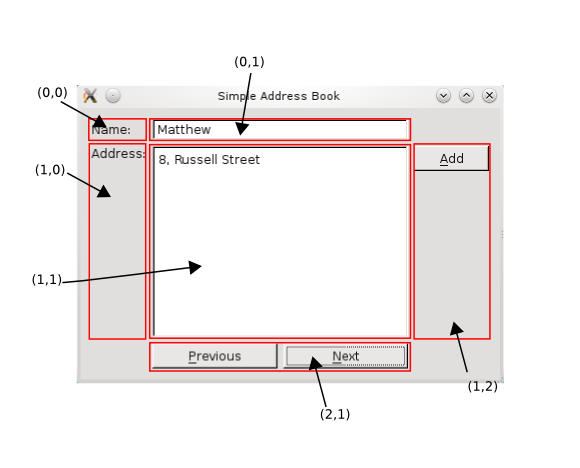 The QHBoxLayout object, buttonLayout2, is then added to mainLayout. The figure below shows the coordinates of the widgets in mainLayout. Within our addContact() function, we have to disable these buttons so that the user does not attempt to navigate while adding a contact. We also include these lines of code in the cancel() function. If the iterator is not at the end of contacts, we increment it by one. If the iterator is at the end of contacts, we move it to the beginning of contacts. This gives us the illusion that our QMap is working like a circularly-linked list. Once we have iterated to the correct object in contacts, we display its contents on nameLine and addressText. If the iterator is at the end of contacts, we clear the display and return. If the iterator is at the beginning of contacts, we move it to the end. We then decrement the iterator by one. Again, we display the contents of the current object in contacts.